Rotarians from Clubs in the North of Scotland support many projects overseas. Our clubs work directly with Rotary clubs and communities around the world to provide sustainable clean water and sanitation systems, fight hunger and disease, improve literacy and education, enhancing maternal and child health, and help to grow local economies. When natural disasters, such as earthquakes, typhoons or floods occur around the world, Rotarians are usually among the first people to take action. We organise collections and raise money for the various charities that are best equipped to provide relief for those in need. Through our support for survival kits such as ShelterBox, AquaBox and Disaster Aid we help to provide the basic essentials required in an emergency situation. Click here for a link to how each of the survival kits reaches people in need when disasters strike. Ethnic cleansing in Rakhine State, Myanmar, has forced over 700,000 Rohingya refugees into Bangladesh. Food, water, shelter, medical care for families and safe spaces for children are urgently needed. Visit Children on the Edge or Save the Children or DEC and the Rotary Box charities. Rotarians educate and mobilise communities to help prevent the spread of major diseases such as polio, HIV/AIDS, and malaria. Our members from the medical professions use their expertise to run overseas clinics. These include providing prosthetic limbs and glasses to those in areas of the world where these items are desperately needed. Information about some of our work can be found by clicking on the menu items on the right. Click here to see the International Service presentation given at the 2018 Assembly. 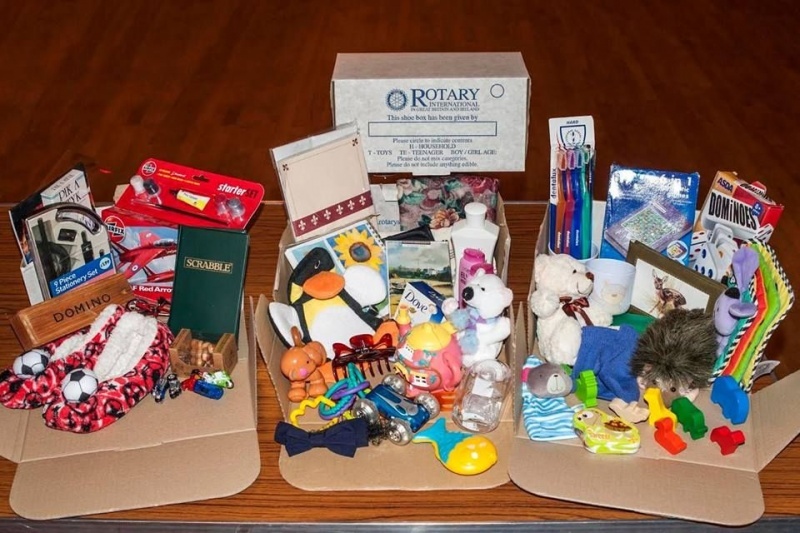 Rotary Shoeboxes getting ready to be sent overseas. Latest news on the FSH Project, Nepal. From small beginnings to a sustainable future.